My body is so weird. All bodies are weird, really, but mine is experiencing things more weird than normal. I can’t even imagine that… a normal body. I don’t think I would have stopped being so rough, as a little girl. But I think I would have been more conscious of my roughness and of my body. So, my body, like all bodies, is weird. You know when you drink something cold and can feel it alllll the way down? I can feel it in the left part of my back/underarm and sometimes; if I’m lucky, I can feel it in my left arm. My skin is numb and the muscles are SO sore but I can feel it turn cold from the inside, almost. It is my favorite part of drinking cold water, right now. As far as recovery goes, I’m taking a little more time than I expected. I can start using my arm Saturday. So, maybe in a week I’ll be able to see progress and strength and I can dress and bathe myself. I assume once I can bathe and dress myself and get down the stairs to my car, I can go back to work. Goals! “Children show scars like medals. Lovers use them as a secrets to reveal. 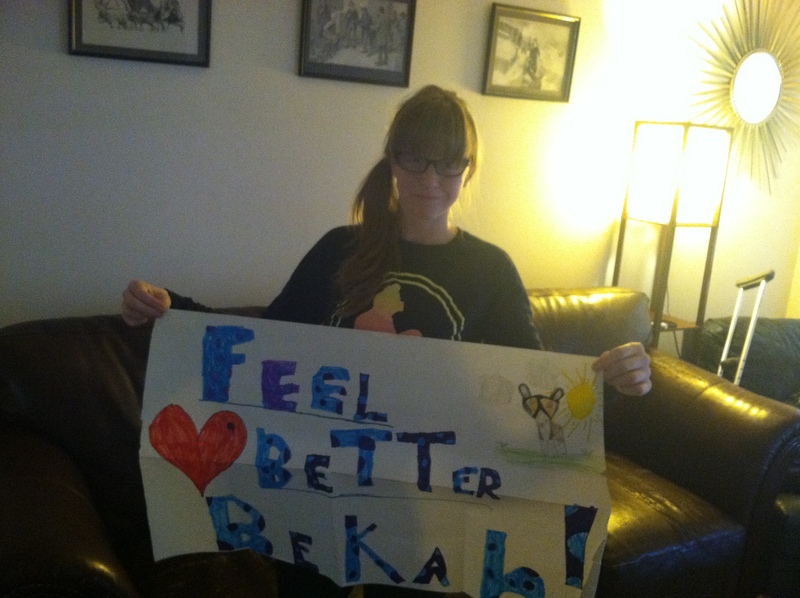 Me with my poster from Audrey and Ella. I love the drawing of Albus in the top corner more and more. Notice the little baby bump on my chest. I am calling it my ‘firefly’. Its so silly! 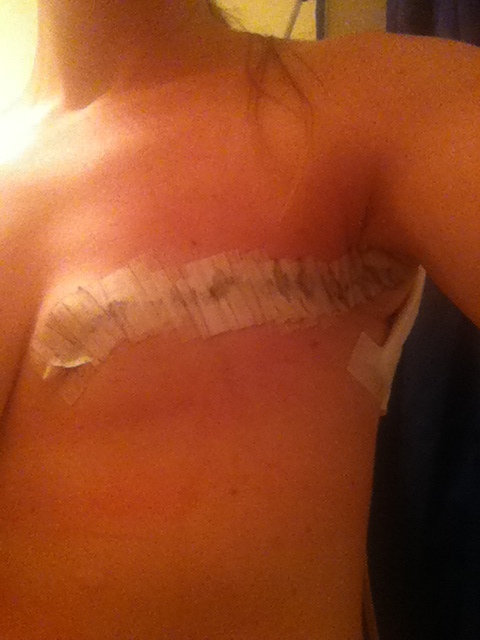 Dressing, day of surgery. 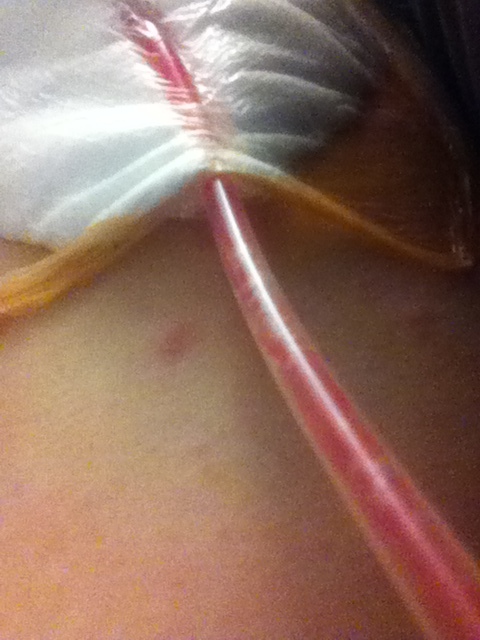 I hate oxygen tubes. 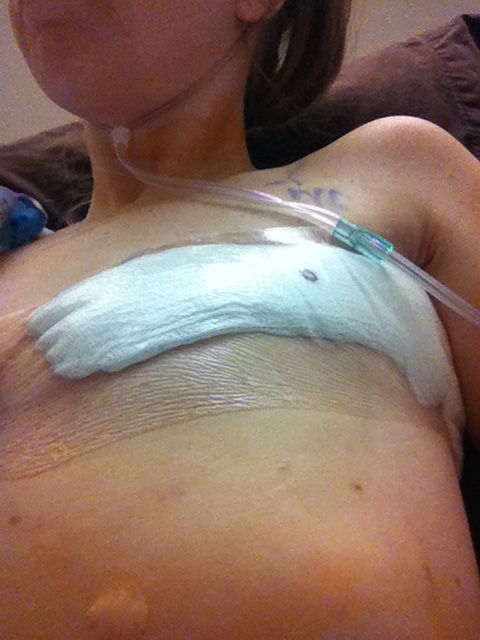 This entry was posted in Breast cancer and tagged Breast, breast cancer, cancer, cancer survivor, childhood, childhood cancer, Health, mastectomy, rough, Scar, tomboy by Fierce is the New Pink. Bookmark the permalink. I am moved by the experiences you have survived already. I can imagine them only because of your honest and unsparing description of those experiences. Thank you for your fierceness. Thank you 🙂 I do honest well! Wonder why it happens… I am so happy it does, but I do wonder!